Last night one of our nurses took us down to the Neonatal “Special Care Unit” so that one of the NICU nurses could give us a tour. The unit is divided into two sections. One unit with 34 Level III true ICU beds and another with 10 or so Level II “Special Care” beds. It was extremely overwhelming at first, seeing dozens of teeny tiny babies tucked inside of little incubators and attached to IVs. 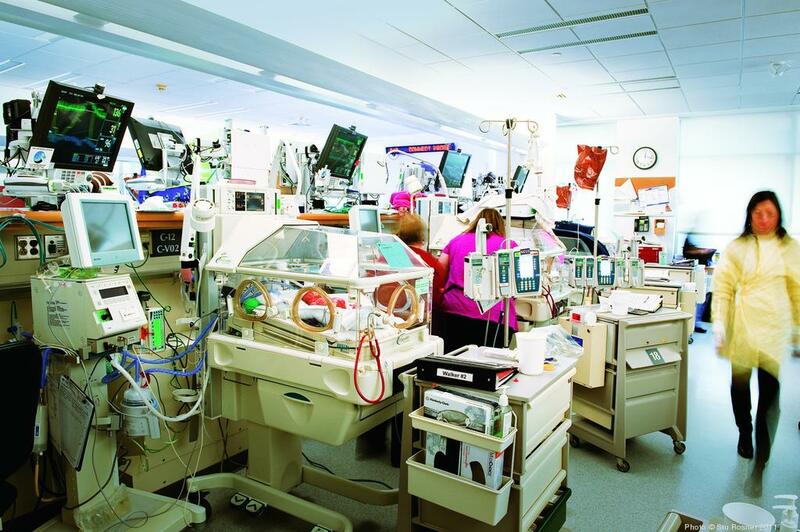 This is what a typical NICU looks like. Any baby that is born before 37 weeks is sent down to the NICU, even if just for assessment and brief monitoring. Each baby has his own incubator that is attached to monitors that track heartbeats, body temperature and other vital signs. The hospital has blankets, but some people bring in their own, that they drape over the incubators to help give the babies the illusion that they’re still in utero. We saw one baby on the Level II Special Care side who was receiving a sponge bath from one of the nurses. He was 31, almost 32 weeks old and just over 3lbs. I have never seen a baby so tiny! He was crying and wiggling around and breathing on his own, which was great to see. The nurse told us that in Abington’s NICU, one nurse is assigned to every two babies. Once our babies are stable, they can be put side-by-side- and willed by cared for by one person, which is nice. Also, the limit for visitors in the unit is two per baby. Since we will (hopefully) have two, we can have 4 visitors in at a time. So Kevin and I, plus 2 grandparents, or siblings or friends can come in at a time which is nice. She also mentioned that they generally tell parents not to expect to bring their babies home until closer to the babies’ original due date. Today, for me, things pretty much stayed the same. I didn’t receive my 1am or 5am dose of procardia this morning because my blood pressure was too low. It was high enough at 9am for me to take that dose, though, which was good. I passed some time today looking for an online childbirth class (I had registered for a number of in-person classes previously, but had to cancel since I cannot be physically in attendance). Also, since Taylor Swift’s album 1989 was released today, she was on television all day long which kept me both occupied and smiling. A resident came in this afternoon during her rounds to check on me and let me know that they’d be keeping me here until I reach 28 weeks (which I already knew) and then they would reassess how I was doing. She said they would likely take me off of the medication or make some sort of change so that they can assess whether I am stable enough to go home. She did mention that New Hope is pretty far away from the hospital, so we will have to see. I know that I mentioned this before, but I’m in the Moms Unit of the hospital, which is where women with high risk pregnancies are placed and monitored. They have a snack room/ kitchenette where they stock different kinds of snacks and juices for all the starving pregnant women. One of the nurses said she would hide some rice krispies treats for me behind the nurses desk, since most of the snacks in the room are not nut free. Tonight we asked for a rice krispie treat and the nurse, unfortunately, couldn’t find them (SOMEONE ATE MY TREATS). So, she went down to the basement kitchen and looked for some and brought us an entire box to keep in our room, which was so nice of her! I was pretty excited but Kevin’s eyes lit up like it was Christmas. He ate his in 2 bites. We’re so thankful to have made it to 27 weeks and are hopeful and praying that we will make it to 28!!! I love all of the updates. Wow have things changed since I had my babies. The pictures of Brayden and Parker are amazing. Great names you two picked. I remember my first ultra sound as looking like a blob and I was pretending to see all of the body parts. That was so thoughtful of the nurse to bring you and Kevin your own private stock of treats. You better not eat to many of them while you are watching Taylor Swift on every entertainment show on TV Cait! Sounds like you are in good hands with lots of caring people around.